Life Is Sweet...: It's been that long! Gosh, I didn't realize that I took a much longer blog break than I had intended. Actually, I've been lazy and just catching up on work. I made a card for Teri's swap that I'm in but I can't show it to you yet until my swap partner gets it. I also made this card the other day. This is foxy. Isn't he or she cute? I guess with a name like foxy, it must be a girl. I picked this Imaginisce stamp up from the store last Saturday along with some matching papers. 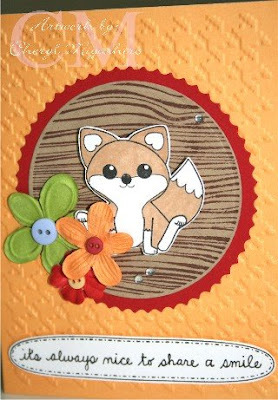 Supplies: Foxy stamp, Hero Arts circle woodgrain stamp, Spellbinders circle nesties, Sizzix Hello Kitty frame, Cuttlebug houndstooth folder, Hero Arts word stamp, Hero Arts flowers & gemstones, Lasting Impressions buttons, and lastly Memento markers from Tsukineko. Last Saturday was quite a surprise at Jean's make and take at the store. Sweet Enjoli from the Big Island stopped in to shop and also do the make and take. She gave me this really cute Hello Kitty container filled with goodies. Thank you Enjoli!!! It was so sweet of you! Well thanks for stopping by and hope you're having a fantastic Friday! so cute your card! I love what you did and I didn't know that the fox is from Imaginisce...I love their line of stuff...gotta get the new paper! they are just so cute! love your RAK from Enjoli too. she is too sweet! 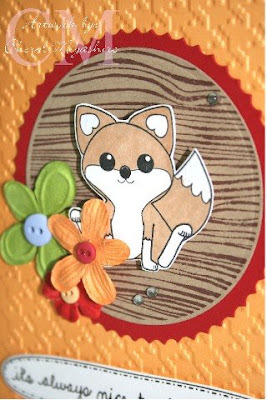 The foxy card is quite unique - with so many variables - nestabilities, embossing background and the unusual wood stamp. 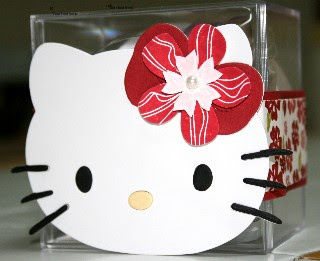 Of course, the Hello Kitty container is so so cute.